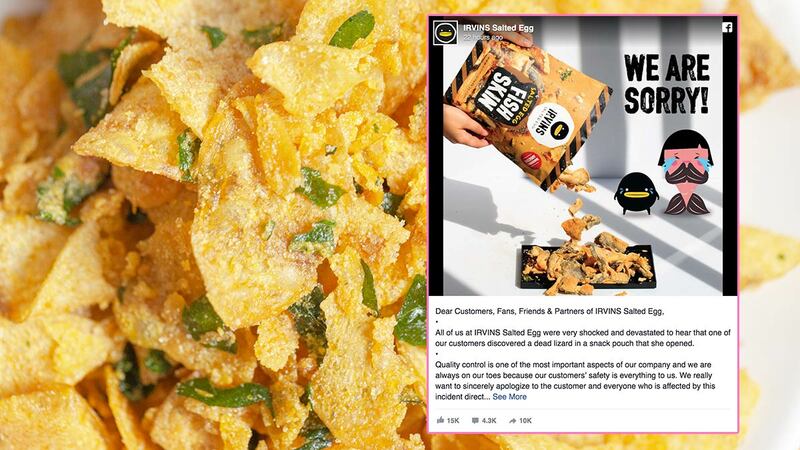 Not only did they apologize for what happened, they were also transparent about the steps they're taking to prevent it from ever happening again: "We promise to investigate this further as we don't have a full explanation on how the dead lizard ended up in our snack pouch and we promise to make the necessary changes in our production to ensure this will never happen again. The case has been reported to AVA and we will cooperate with them fully." People are not only impressed by IRVINS' apology, they're also even bigger fans of the brand now! One Facebook user commented, "This is professionalism at its finest. Mistakes are critical specially in the food business but the honesty and sincerity by which this was written will definitely pave your way towards success in the long term. It seems so easy for most to complain and bad mouth but come on they are sorry. We could use a little kindness and compassion in this world." Another wrote, "Very professional and prompt response from Irvins. It doesn't matter whether it is an accusation or it’s truly a mistake. They take immediate action to rectify this issue rather than dragging with an excuse to investigate the incident to save their reputation at all mean. The best way to save your company image has been shown by Irvins. Their action proves that customers will always be their top priority. A good example to learn from." When IRVINS encouraged customers to call their customer service hotline about expired products that need to be recalled and refunded, someone wrote, "No! No way! I would not return you my IRVIN chips! I don't care what is inside! I will just open the bag and finish everything inside within 15 mins!"